Amrita (Dr. N. Prahalada Sastry) was born in Vishakapatnam, Andhra Pradesh, the first child of Sri Narasimha Rao and Srimati Lakshminarasamma. Guruji, as he is fondly referred to, started his spiritual quest at a very young age. Blessed with divine experiences early in his childhood, his young mind was teeming with questions, searching for the truth. The stage was set for his spiritual inclination that was to intensify later in life. In the meantime, in 1977, Guruji visited the Balaji temple in Hydarabad. He went in and prostrated before the Lord. He felt an extreme thrill pass through his body; and Guruji had his first initiation from Balaji, that is Balatripurasundari. This proved to be the turning point in his life. After deep thought, he decided to look into the spiritual aspects a little deeper and devote time to work for the upliftment of society. He received Sri Vidya Poorna Dhiksha from Sri Swaprakashananda Natha Thirtha Avadhutha of Anakapalli. And he was showered with the Grace of Devi Saraswathi and given the dhiksha name of Amrita. Involved in defense research at TIFR, his mind was in search of the truth within himself. It was at this juncture that he was offered a position of Professor of Physics at the Lusaka University in Zambia. Realizing that this was an opportunity to take a fresh look at one's self, he accepted a two year contract to work in Zambia. 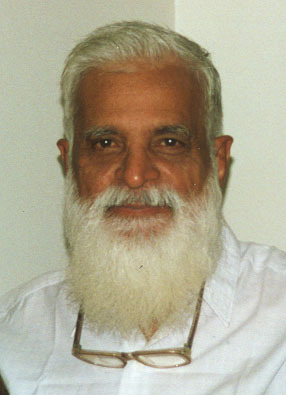 It was there that Guruji met his "spiritual son", Sri Wijayaharan and accepted him as his disciple, in SriVidya upasana. In 1983, during Devi yagna, Guruji was approached by the brothers of the Putrevu family, with a request to build a temple for the divine Mother. In addition to the three acres of land that they had donated, Guruji bought the adjoining ten acres and it was registered as land for the Devi temple. Having acquired the land, Guruji was looking for divine guidance, a sign of approval to commence construction of the temple. In the vicinity of the donated land, there was a small hillock where Guruji would often spend time in meditation. On the slopes of the hillock, he noticed a formation very similar to that of the Kamakhya Peetam in Assam. One day, while in meditation he experienced himself lying on the Peetam, while four others were performing a homam with the flames emanating from his body. And during purnahuthi, he felt a heavy object being placed on his heart. Awakening from his meditative state, Guruji was prompted to dig that site. Unearthed from that very spot, he found a Sri Chakra Maha Meru made of panchauloha. It was later discovered that a huge yaga had been performed in that area more than 250 years ago. Guruji had visions of the Devi as a sixteen year old girl. With Her Blessing's, he built the Kamakhya Peetam on the hillock and a Siva temple on the peak, in 1984. 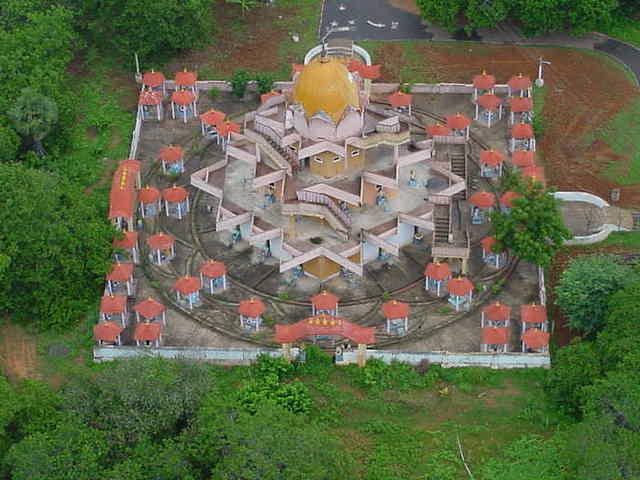 Construction of the Sri Meru Nilaya in Devipuram was started in 1985. Built covering an area of 108 square feet, the temple has 3 levels and stands 54 feet tall. The temple has the idols of all the Devis described in the Devi Khadgamala Stotra. The temple construction was completed in 1994 and the kumbhabhishekam celebrated with great pomp and piety. 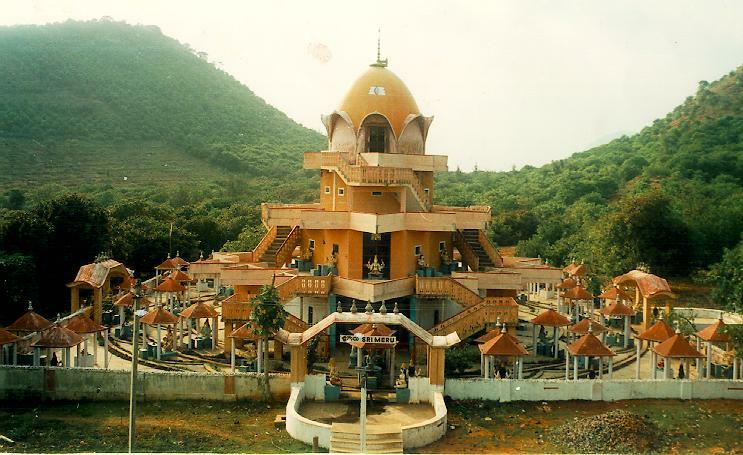 This temple is unique in allowing the devotees to perform puja to the Devi themselves, without distinction of caste or creed. With numerous loving disciples all over the world, Guruji and his wife, Srimati Annapurnamba (lovingly known as Guruji Amma) have dedicated their lives to the service of the people. They have established the Sri Vidya Trust for this purpose.